Have you heard of BTS? If not – well, let me tell you about the Pop/Hip-hop sensation from South Korea that is taking the world by storm! BTS is a South Korean music group that debuted in 2013. 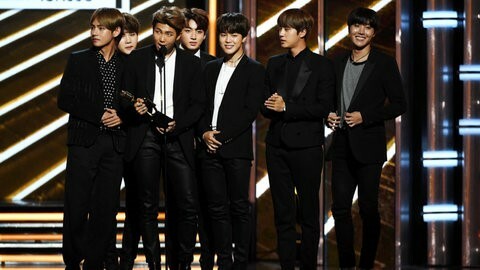 In 2017, they made history by being the first South Korean group to be nominated for and win a Billboard Music Award (in the Social Media category). Since then, they’ve been shattering records and making history basically as a full-time gig. This year, they’ll be coming back to the States for another tour (which sold out almost instantly) and will even be playing at Citi Field in New York (another historic milestone never before achieved by a South Korean music act). Well, so what? What makes this group so special? I am *SO* glad you asked! I sat down with Library Pages Bella C. and Maddie T. from our Okemos Branch to get some insight. What got you into BTS? How did you hear about them? B: I first heard about BTS through my friend in Spain two years ago and really liked them. M: I saw Love Yourself: Her at the library, and saw the photobook and wondered “Why are people so obsessed with this?” Then I went home, and the first music video I saw was “Save Me”. I feel like it was an instantaneous thing and I was hooked! I listened to their songs on the way to work and it was great. What do you find most appealing about them? B: The whole band works super hard and you can see it through their interviews how much they love ARMY*. Oh, their fashion is super like on point. M: I stan** a lot of groups but they are the most willing to talk about mental health. Especially Yoongi’s mixed tape talked very heavily about suicide. Korea is incredibly strict and they are good at pushing boundaries on the older generation. And I feel like lyric-wise, they are on a different level. How about the language? Do you understand Korean? If not, does the fact that it’s in another language affect how you experience the music in some way? B: Language is not a problem because it inspires other people to learn more about their culture. M: I’m learning Korean at the moment. But music is incredibly universal, so I would say that in a way, it doesn’t really hinder your ability to stan them. Would you recommend them to someone who’d never heard them before? If so, why? B: I would 1000000% recommend someone to listen to them, or just Kpop^ in general because their music is universal and there’s something for everyone. M: I think the biggest reason why is that they are worthy of your praise. Second, I don’t think it’s ever a bad thing to be exposed to other cultures. If you’re interested, you can read more about BTS in the February 2018 issue of Billboard Magazine, available through RBdigital. You can also check out several their CDs and even a piano cover album from hoopla! So, what do you think? Will you give BTS a try?